My husband likes to have chicken salad for his lunch so I try to find different recipes on the internet to make for him. This is one I made that he liked. Yippee! This Chicken Salad with Grapes, Apples and Cranberries is very easy to make. Easy is always good. I love easy! We buy frozen boneless skinless chicken breasts at Costco in a large bag. It works beautifully for these lunch salads. Ready to try it? Here ya go! Boil water in a medium sized pot that will hold your chicken pieces then bring to a simmer. Add the chicken and cook for approximately 10 minutes. Use a thermometer to check the temperature of the chicken so it’s not overcooked. 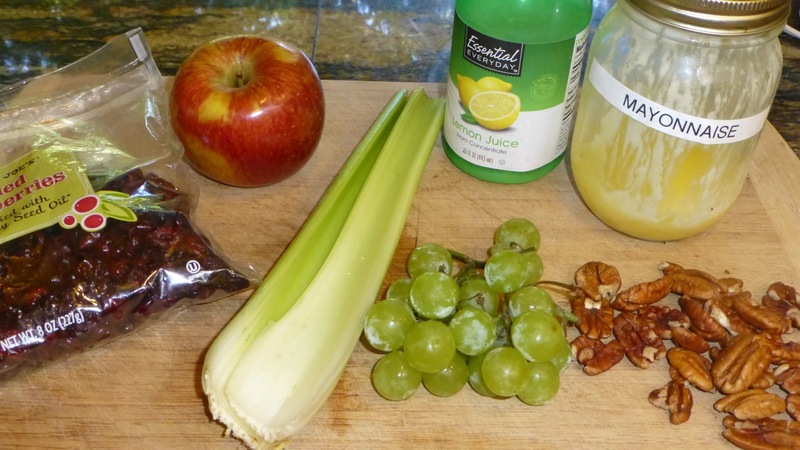 While waiting for the chicken to cook, get a large bowl and add the cranberries, celery, grapes, walnuts and the apple. Give it a good toss to combine it all. In a separate small bowl, combine the mayonnaise with the lemon juice then season to taste with salt and pepper. Set this aside. Once the chicken is cooked, pour out the water and allow the chicken to sit until it’s cool then shred it with your hands or (as I did) dice it in bite size pieces. Add the chicken to the cranberry mixture. Pour the dressing into the large bowl with the chicken, fruits and vegetables and combine everything well so that all the ingredients are coated with the dressing. Eat right away or refrigerate for a great lunch salad.